It is a new month of challenges at CASE Study, which means we have a new muse! I am so very excited, as she is a designer I very much admire! And we will be having some spectacular cards to CASE! Here it is, this months muse….Jocelyn Olson!! We also have a new Guest Designer joining us this month. Happy to have you on board, Tracy Mcneely! So beautiful! I haven’t used butterflies in a while, so I thought this was a good opportunity to use them. I realized I only had about an hour to make a card, take a photo in the daylight and submit on time, unlike my usual late submissions. I printed out Jocelyn’s card, looked at it for a moment then went to my craft area. The image that came to my mind was a colorful background within a frame and some butterflies flying about. I looked around and saw my box of AC hemp twine and decided to wind them around a rectangular piece of watercolor paper (I basically wanted something thick and sturdy, and of course, white). It came about in no time and I was happy with my first try. Once I was done assembling the frame (I used 1/16″ foam tape behind the stringed panel, and 1/8″ foam tape behind the frame), I decided to go with one solid white butterfly. The sentiment took a little bit of thinking; I cut out a strip of vellum to put over the strings, but I didn’t like how that looked. Stamping it next to the butterfly seemed to be the best option. This whole process took about half an hour, probably the quickest card I made for a DT challenge. Furthermore, the skies were clear with just the right amount of clouds, so I was satisfied with just a handful of pictures 🙂 So you can see I was quite happy about this card! If only all my cards were that efficient! Make sure to visit the CASE Study challenge blog to see what the rest of the DT came up with, as well as Jocelyn’s stunner of a card CASEing herself. It’s so elegant, such a lovely background for the white butterfly to just be, love the simplicity Tasnim!! You continuously surprise me with your unique out of the box ideas – this is another stunner! Wonderful mix of colors, especially having the yellow in there! Great idea to use the hemp, but even greater idea to have all those angles in the wrapping. Very dynamic! Stunning in Simplicity …. I love it Tasnim . Thank you for sharing. Tasnim that frame and the wonderful colours of hemp twine is so beautiful. Topped with a pure white butterfly is amazing. Thank you for the warm welcome! Oh my gosh, you have wowed me again!!!! LOVE LOVE LOVE this! Another amazing card! I wonder how do you end up with these unusual solutions, like the hemp twine or the stunning mosaic technique… that’s thinking outside of the box!!! Visiting your blog is such a treat! I appreciate your creativity so much! This card is so unique and totally fabulous! What can I say…. WOW! What a stunning card Tasnim!! Just love the thread!! I saw this at CASE and had to come in for a closer look! AMAZING! 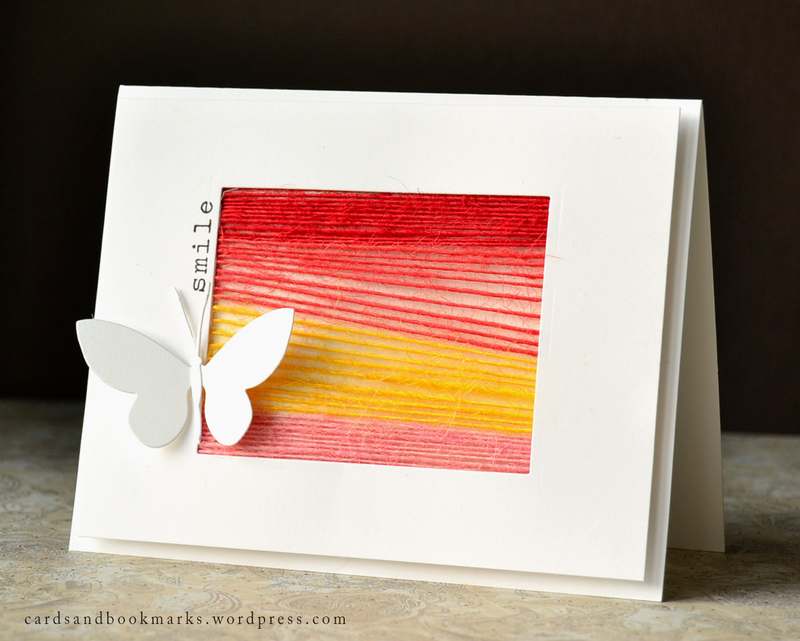 Love the rainbow of string – the texture and the clean look – this came together beautifully! perfect inspiration for this challenge. the crisp white, perfectly cut and assembled frame and elements are a great frame for those flowy colors…the movement in the twine made me think of warm summer breezes! beautiful card! FANTASTIC card Tasnim – LOVE the wrapped twine & you framed it perfectly!